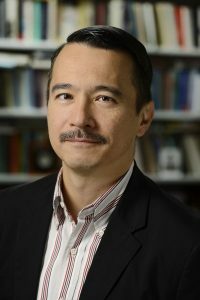 The English Department is proud to announce Prof. Doug Mao is the recipient of this year’s Faculty Graduate Teaching/Mentoring Award. A student nominator wrote “Doug is a fascinating and engaging classroom presence. He also taught me in word and example how to build a career: how to navigate conferences and symposia, how to connect to other researchers—the things that form the day-to-day life of scholarly work, but which no one can learn in a seminar or in comments on a paper.” Professor Mao has been with the English department at JHU since 2007.